Wow what a journey! Have you ever tried to write a book? I can tell you it is the most amazing journey a person can undertake, especially if the book is about real life events or about a person who truly existed. My journey has been packed with revelation, inspiration and perspiration. Piddington’s Secrets has been in the making for an incredible seventeen years, beginning in 1998, seven years after Sydney Piddington passed away. I know this may sound absolutely ridiculous but the events leading up to this book seem almost divine. I am not suggesting that the ghost of Sydney Piddington somehow steered this book into existence but it sure feels that way. 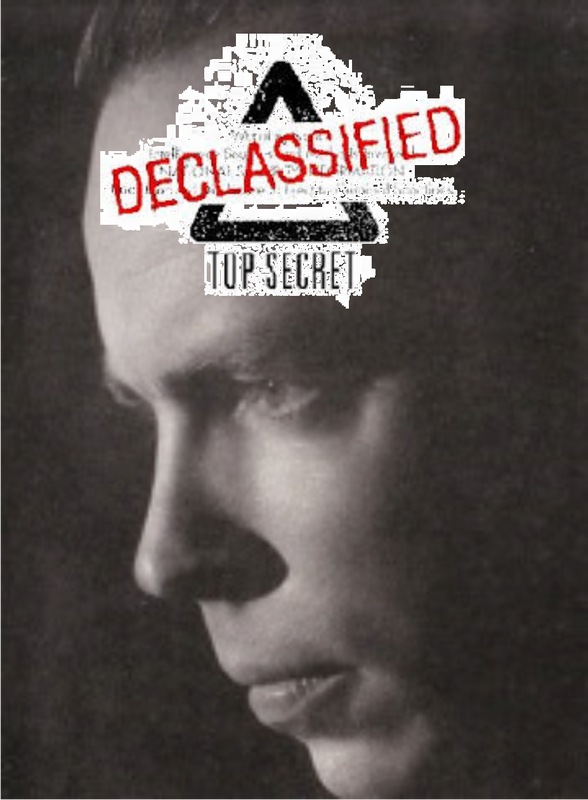 He was adamant in life, and rightly so, that his methods be kept secret, that no other magician should be allowed to perform his inventions or adapt his systems for improved or bigger telepathy effects. I suspect the spark for his act was a contributing factor in this. He was in the Changi POW camp suffering the hell of hunger, weakness and the fear of death. 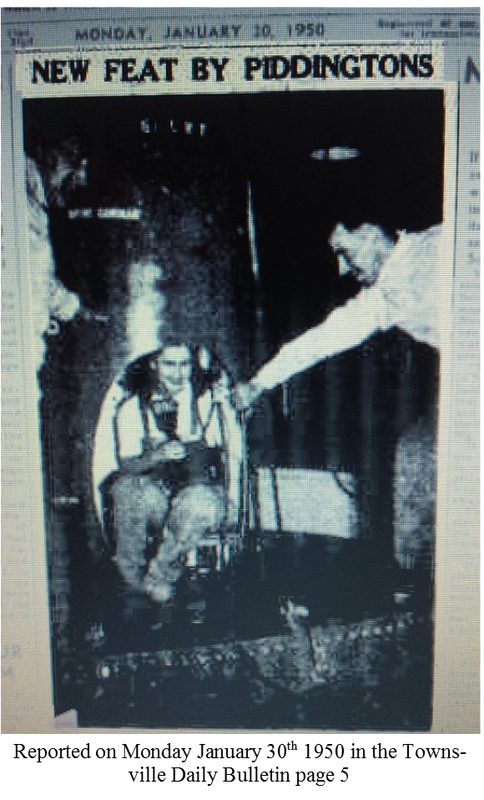 The idea to create his act came accidentally through a chain of events that ended with him reading a stray copy of the Reader’s Digest magazine, in which, happened to be an article on Extra Sensory Perception. The effort that went into devising his methods in a place where any future looked uncertain must have created a strong emotional attachment with his methods, the tricks being as refreshing as a water supply in a harsh and merciless desert. My journey began back in 1998, when I was working as a producer and presenter. I had my own radio show in London called ‘The People’s Show’. I interviewed many celebrities for the series and this led to writing a book with British magician Paul Daniels on the subject of ‘Con Games.’ That’s when my father mentioned that his father, my granddad, worked with Sydney Piddington back in 1949. It was just an ‘off-the-cuff’ comment. Growing up, I remember hearing many stories about the old days from my extended family members, which included behind the scenes adventures with the Piddingtons. But at the time I did not make the connection that these memories were of Sydney and Lesley Piddington, this was because Sydney was referred to as ‘Piddo’ and the couple referred to as ‘the Piddos.’ That said I still had no idea of their importance until I began to research the name ‘Piddington.’ Even then I had no idea the methods had never been discovered. So you can see how slowly and how long it took me to really begin to realise what was trying to unfold. I mentioned that it seemed like ‘divine intervention,’ because of the way I began to unravel this amazing piece of history. After my father’s ‘off-the-cuff’ comment in 1998 I conversed with family members who told me more about my Grandfather’s involvement in the Piddington’s BBC broadcasts. At this time I was just curious, there was no intention of writing a book. Each time I stopped thinking about this story something else would come to my attention, usually coincidentally, that would cause my interest to awaken again. It could be a comment, seeing some mind-magic on television or when a boring quiet Sunday gave me time to hear my thoughts. A visit to my elders was always magical. I would like to thank my Nan’s brother who we called Uncle Dave for showing me the card tricks he had learned from Sydney, although he never revealed to me how they were done. However, his many stories about his adventures with the BBC shows and the social meetings he enjoyed with the ‘Piddos’ were fascinating. Uncle Dave has since died, but I am sure he is still baffling them all up in Heaven with his well-practiced card skills. Uncle Dave’s wife Bridie Daye deserves recognition for all the times we sat up overnight just talking about how the ‘Piddos’ devised their demonstrations and of the many funny and worrying events from behind the scenes. We spoke of life, love and shared our whines about the world. I thank my Father for his help in searching our disorganised attic for all and anything from the Piddington days. 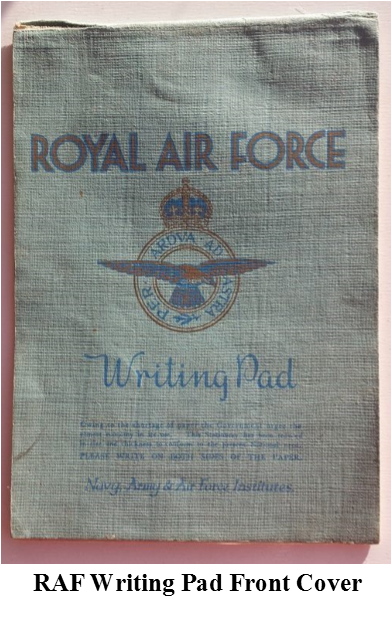 I was hoping to find photos or letters but instead found my Grandfather’s RAF notebook, containing the methods that allowed Sydney Piddington to produce the miracle of thought transference in the studio, on stage and even in a scientific test conducted back in the Changi POW camp. This was my biggest find and one I studied over and over again to really understand what I was being told by this now fragile notebook. After a slow but fruitful 15 years of gathering information about the entwined events between my elders and the Piddingtons and the discovery of the RAF notebook I needed to find as many recordings of the shows that existed. I needed to see if I could actually hear the methods being used. Like a well-timed divine hand out of the dark, I accidentally discovered Jesse Cox, Piddingtons grandson, a man with a keen interest in discovering the methods. It was only at this point I discovered that even the immediate Piddington family didn’t know how it was all done. Jesse had tried to discover the secrets by asking his grandmother Lesley to share the methods with him, but she refused to do so. Jesse wrote an award winning radio documentary about his quest, which ended in him remaining in the dark. This was when I had the idea of writing this book. I contacted Jesse and told him I knew their methods and asked if he would allow me to write a book about them? He said I could. I thank Jesse for all his help and support, for sharing the BBC recordings with me and putting me in touch with others. My research intensified as I contacted all I could find who had ever researched or met the Piddingtons. 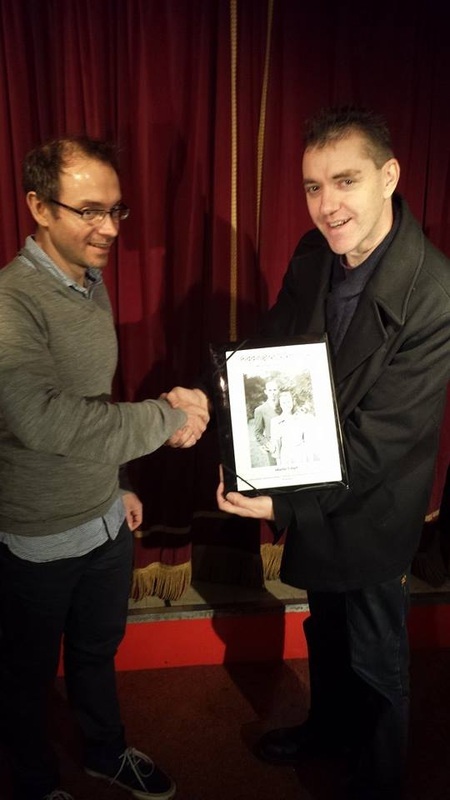 Thank you to the talented Nigel Stark for his contribution to keeping the Piddingtons story fresh and the great Barry Wiley for his close and personal insight to Sydney Piddington’s life during his final years. I recommend Barry Wiley’s CD documentary ‘The Piddingtons’ for the exclusive recordings of Sydney explaining his ideas and the remarkable insight into the journey the act took. A download version is available online. 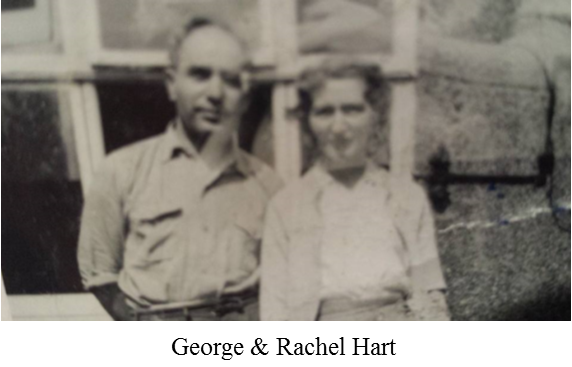 Many thanks also must go to Sydney Piddington’s second wife Robyn Piddington (nee Greig) who agreed to rummage through her stored memories for the original radio scripts. There were times when I felt worry, mainly because I was revealing another magician’s secrets, a man who never allowed his secrets revealed in his own lifetime. I often battled with my conscience asking myself, was I doing the right thing? Here was a manuscript designed to end a controversy that took Sydney a lifetime to create, methods that were born out of a desperate need to save lives by rescuing the POWs from thoughts of never going home. I would like to pay a special recognition to my dear sister, Jacqueline Hart who battled my demons with me over the final year of writing this book. I thank her for her support and encouragement and for allowing me to bore her silly with the same subject matter. I would also like to thank both Joe Pon, owner of Misdirections magic store in San Francisco who made me feel so welcome, and Bill Davenport of the Davenports magic shop in London, for their encouragement, and for discussing with me the importance of passing down these methods to the magic industry, thus giving me further confirmation that I was indeed doing the right thing. I thank my Father, Brian Hart, for being a great Dad, an inspirational part of my life and for always making me feel safe when I have felt so vulnerable. Thank you Dad, for being the guinea pig when I wanted to try out Sydney’s cunning methods for myself by performing them privately to the family, and (ironically) for not revealing how I did it. On the academic side, I would like to thank my editor Caroline Kafka for all her hard work, for her direction, ideas and dedication. I have structured the book to allow you the freedom to jump around the chapters in an order of your own choosing, without missing-a-trick. I know you may want to race forward to seek out the methods that have baffled you, or jump ahead to a particular broadcast. However you choose to read the book, I am glad to share this history and hope you enjoy the incredible journey the amazing Piddingtons travelled. Above: Inside Book: The sincerity contract. 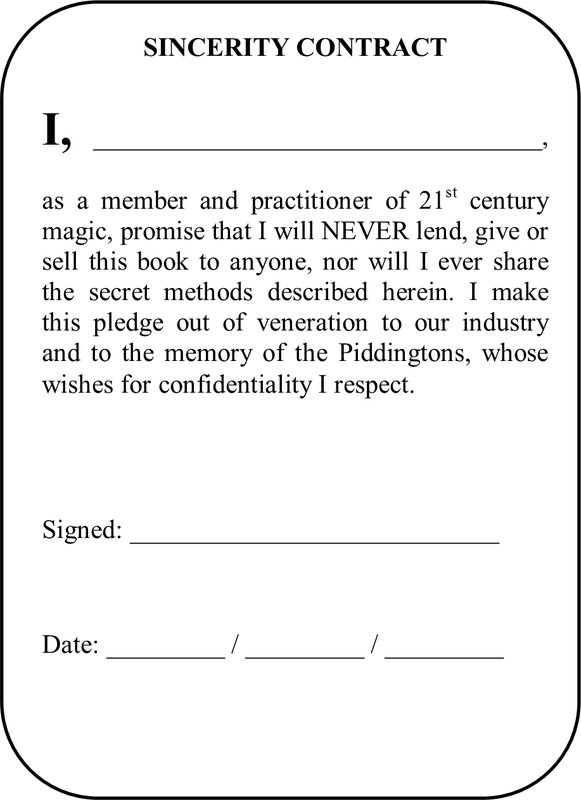 Magicians pledge to keep Piddington's Secrets secret. Sign the promise, take a photo and email to Promises@ThePiddingtons.com Above: where it will appear in the gallery of promises. Above: Bill Davenport, of Davenport's Magic London, becomes the first magician to learn Piddington's Secrets as he embarks on the first book review. Above: Inside this writing pad are the methods Sydney Piddington invented to achieve some of the world's most baffling telepathy effects. Above: Surbiton Diving Test Centre: Lesley Piddington will be submerged under 12 feet of water inside a diving bell to psychically receive a line from a book from Sydney who is 12 miles away.